When I first set off the University we were given a list of books and products that we would apparently find very useful throughout the course. There was the usual, books we’d never in a million years read, pens and pencils, a couple stacks of paper, but one of the items on there was something that, in my lower class upbringing, meant nothing to me. A Introduction Set of Designer Gouache. I’d heard of Goulash, but I wasn’t sure that was quite what they meant. So, totally bemused as to what I would find, I set off the nearing art store to find this goo-ash stuff. Turns out, it was a type of opaque watercolour. I’ve used watercolour and acrylic before, of course, but this was like heaven in a tiny squidgy pot. I loved the stuff! It had the strength of acrylic with the spread of watercolour, and better even than both, and ever since it’s been my paint of choice. However, once uni was over and those two years of mind numbing boredom passed and inspiration hit once more, I found myself addicted to Letraset Promarkers, and they were so wonderful to use with my little pet illustrations, and gouache sadly got rather forgotten. It sat in it’s little box, it’s colourful squishy magic unused and unloved for the best part of three years, until I came across it again one day whilst clearing out ‘that’ cupboard. Whilst I only seem to have one intact brush remaining, and have yet braved Hobbycraft to get another set, I’ve thoroughly enjoyed the freedom that working with paint gives over working with ink. And gouache, in particular, is such a fantastic medium to use. As it is water based, I don’t have to worry about any wasted paint and can reactivate the palette whenever I fancy, which makes it convenient as well as pretty. When using it throughout my degree it was used, alongside Chinese Ink, to paint very delicate and detailed jewellery design proposals and illustrations, so it’s very freeing to be able to work a little bit larger. I’ve still got a lot of practicing ahead, but I’m enjoying the journey. Below are a few example of some of the pieces that I’ve been working on the past two months. Personally I think there’s a little bit of a theme going on here, but I’ll let you all be the judge of that. 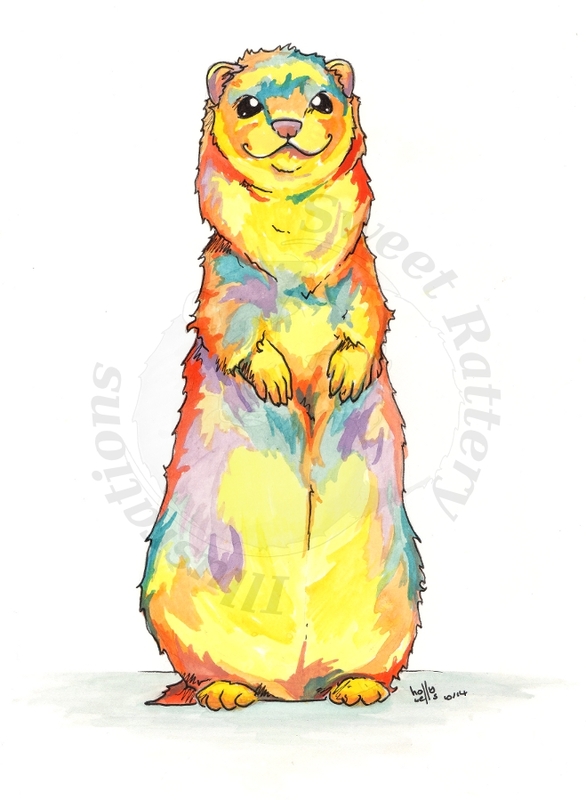 The first piece – rainbow rat with slight wash.
One of my first attempts to illustrate a ferret in a good year or more, turns out they work quite well in … rainbow. 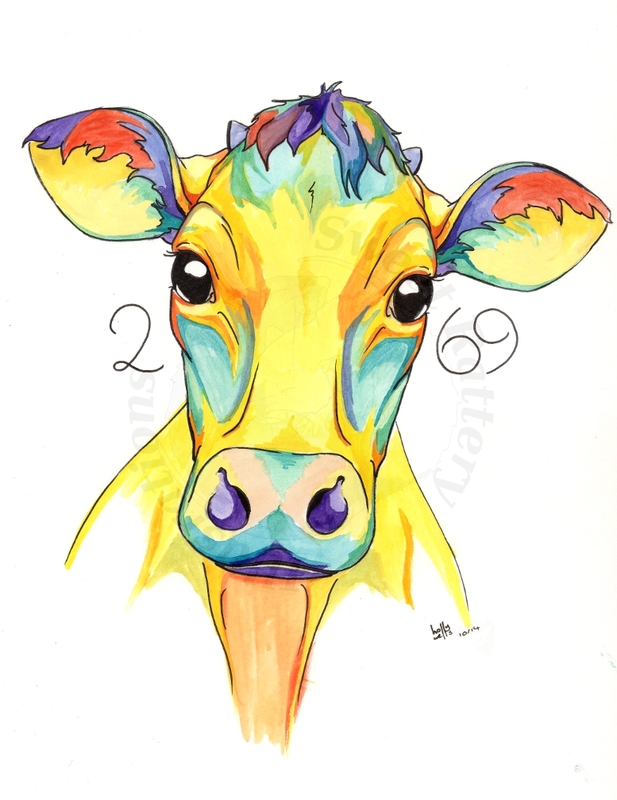 Perhaps betraying another key interest and care of mine, you either know what I’m talking about or you don’t here 😉 But everyone loves a pretty cow. In rainbow. By this point I had grown more familiar with the process and the paints, and starting to feel a lot more comfortable with the strength I could work at. In rainbow, of course. There are quite a few other pieces that I’ve worked on since, and it’s an idea that I wish to continue with and grow upon in the coming year. Gouache really is wonderful paint to work with, and if you’re a fan of watercolours and/or acrylic then I very much recommend giving it a go. Perhaps it took a little longer than it ought to have done, but finally I have myself one of these fancy online mind dumps where I can share, well, my artwork and my musings. So, let’s start of with a little introduction. My name is Holly Wells, living in Kent UK and born in 1990. Technically I think I have to class myself as an adult now. Two years ago I started a small hobby-type business, drawing ink pet portraits on commission, bringing in a little money here and there to help support my other hobby of keeping fancy rats. 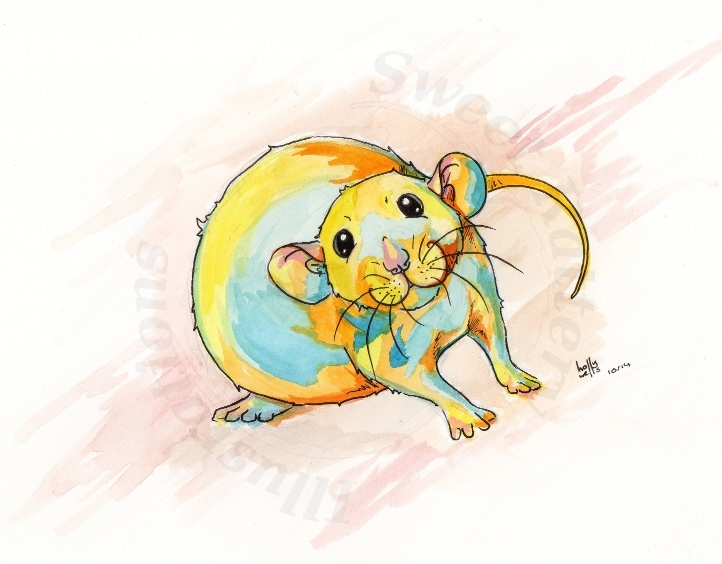 Sweet Rattery Illustrations (as it was then known) started out from a couple of drawings I did of a friend’s group of ratties. I got a few requests in, and before long I was taking in weekly commissions for rat portraits. 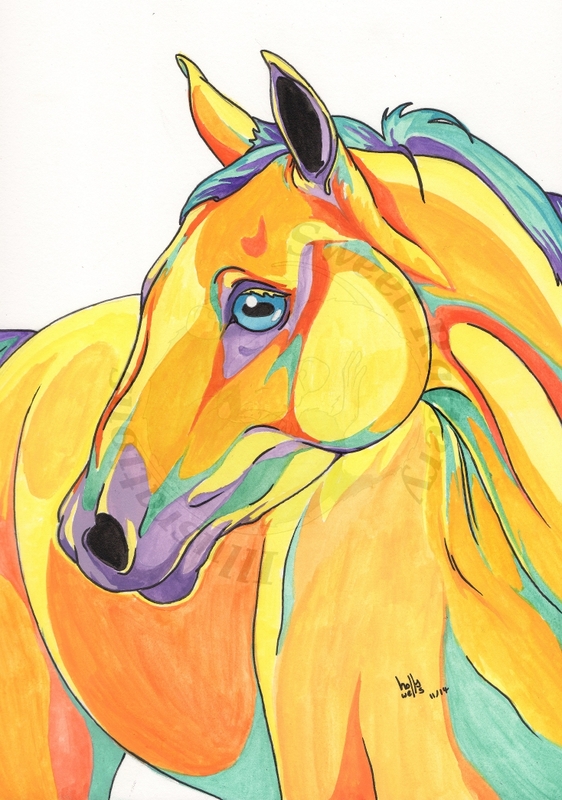 Over the course of the first year, I was able to charge a small fee for the drawings, but it was into the latter half of the second year that things really started to take off. I am now working part-time admin for another company, and part-time artist for Sweet Rattery Illustrations, and hope that at some point in the coming year I can finally quit the day job and start doing the artist bit full time. So, hello and welcome! The Sweet Gang (AKA The Rat Hoard) and I are pleased to see you here.